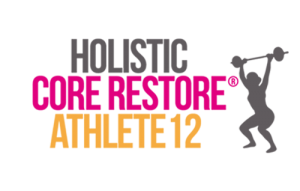 Holistic Core Restore® Athlete 12 is a 12 week online programme designed to get you fitter, faster and stronger, by upping the intensity and upping the effort so that you’re ultimately able to go for longer because you’ve built a strong foundation. You truly will enter ‘athlete mode’ with this programme and have a lot of fun getting probably the fittest you’ve ever been. The course will run through both a private Facebook group and an online portal. Each week you will be guided through a workout approximately 20 minutes in duration and progressed weekly by programme creator Jenny Burrell, and in addition, I will deliver two additional online sessions, so you actually have the benefit of two Coaches for the entire 12 weeks! Before starting, you will complete a full health screen to make sure you are suitable for this programme. Once I’ve confirmed you’re good to go, the programme will begin with SET UP, where we help you get prepared for the coming 12 weeks including taking your Fitness Test and logging your start point measurements. You will need equipment! Some of this you may already have and some you may need to purchase. I would suggest Amazon / Decathlon for this.